The wrapper is dark brown and has a turtle shell effect as the network of slightly raised veins carry a lighter color to them. 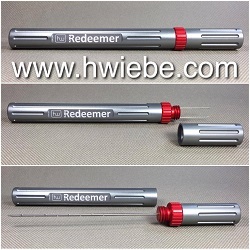 The seams are smooth but easily detected due to the color variation of the wrapper. The head is finished off with a well applied double cap. The band is orange, gold and white and has a classic style to it. 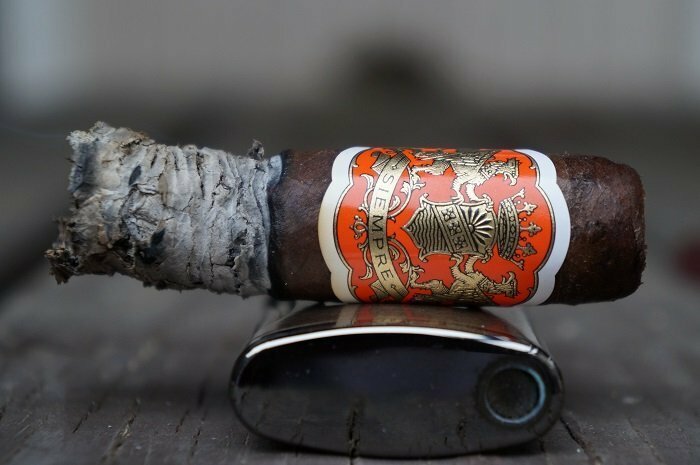 The aroma from the wrapper is a mix of leather and slightly damp wood while the foot brings wood and stone fruit sweetness. The pre-light draw consists of dry cedar with a mild spiciness. 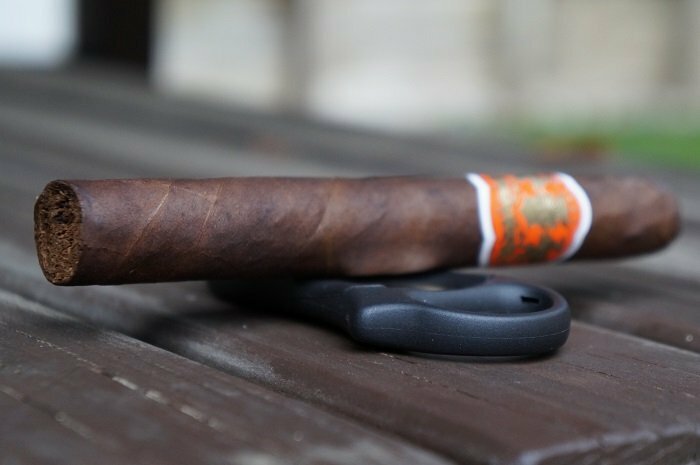 The Dapper Siempre Sun Grown Toro is well constructed and has a nice give to the wrapper with touch. 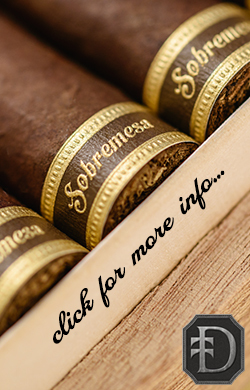 It is soft and smooth in texture and sports a Dark Natural, soft Maduro coloring. Small veins are present throughout and there is an aroma of hay, earth and barnyard on the wrapper. The foot is showing more cocoa, stone fruit, wood and earth notes. 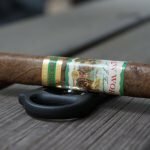 What really catches your eye with the cigar is the band, not the wrapper. The cigar begins with cedar and a creamy cinnamon note. At a quarter inch in, the creamy cinnamon adds some black pepper which creates a unique combination while the cedar is still a core component of the profile. At a half inch in, the cedar and cream are up front as the cinnamon and black pepper mixture are faint in the background. At an inch in, the retrohale is presenting an even mix of cedar, cream and baking spice. At an inch and a half, the profile consists of a creamy and spicy cedar. As the third comes to a close, the spicy cedar gains a toasted note to go along with the cream. The strength in this third was right at medium. The first third begins by delivering lots of spices. I am getting some red pepper and cinnamon and it is a nice combination. 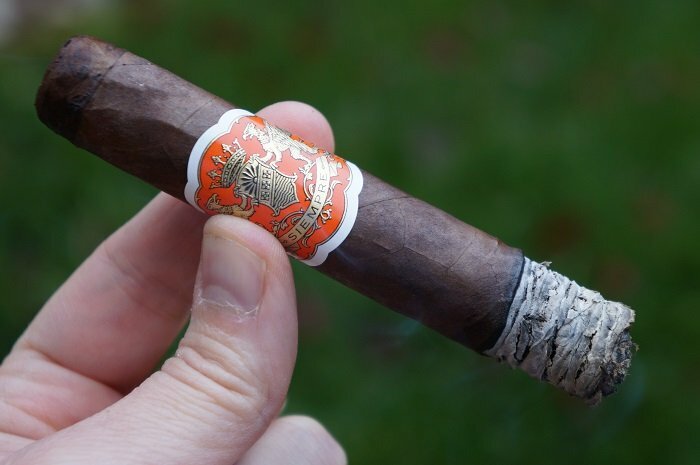 There are some leather, rich earth and sweet tobacco notes as well, and this is a medium-full first third. As the second third begins, the profile of creamy, spicy and toasted cedar continues. 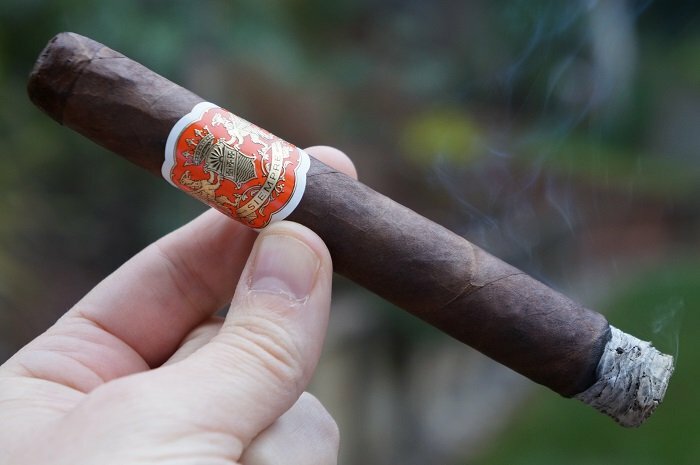 At a half inch in, the cream transitions to a mustiness and continues to pair with the spicy and toasted cedar. At an inch in, the toast note is replaced by a light char of the cedar. The spiciness has left but the mustiness remains. The retrohale carries the lightly charred cedar along with a faint mustiness. At an inch and a half, the cedar transitions to oak and still carries some char while the mustiness is at an even level. As the third comes to a close, the creamy charred oak continues. The strength in this third remains at medium. 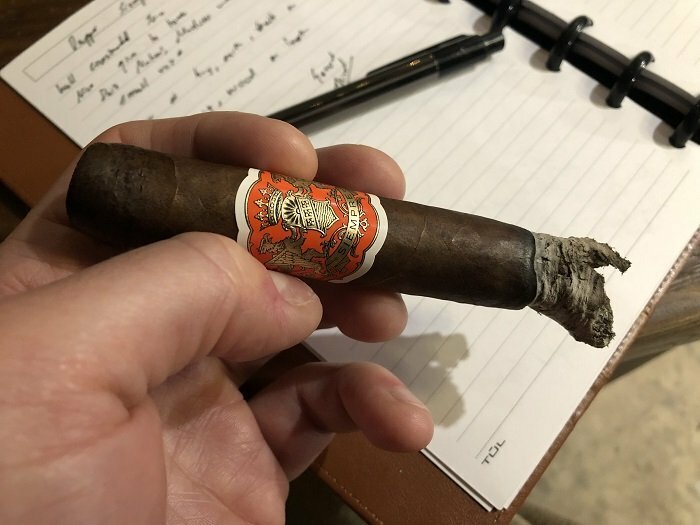 As I get into the second third of the cigar, I find some more meatiness making an appearance and with that is some leather, soft spices and a nutty quality. It still has some cocoa/rich earth qualities to it, and it is very enjoyable. 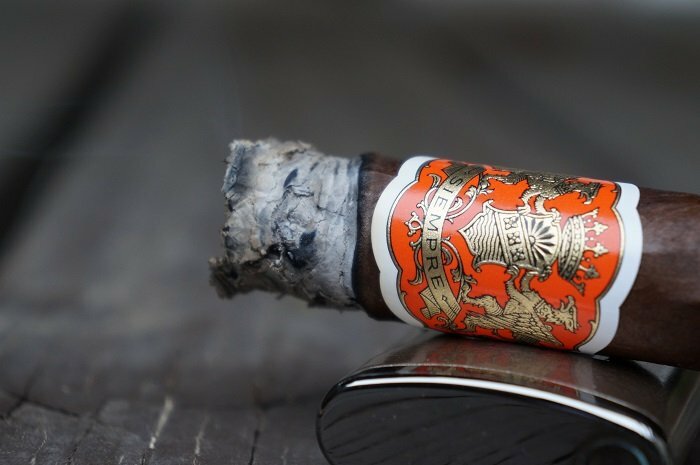 There has been some decent transitioning from the first third and the cigar is remaining at a medium-full level for body and strength. As the final third begins, the creamy and charred oak is continuing on as some earthiness joins the profile. At a half inch in, the char has increased bring a slight bitterness to the profile. At an inch in, the bitterness has dropped out and the profile of charred and musty oak is the same profile for the retrohale. 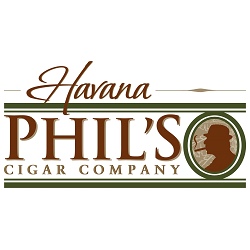 At an inch and a quarter, the cigar warms up which brings a toasted note to the oak along with a slight mintiness. The strength in this third bumped up to slightly above medium. I am in the final third of the cigar now and there is a continuation of spice and earthy notes. There are some floral qualities now present and with that is some leather, wood and nuts. 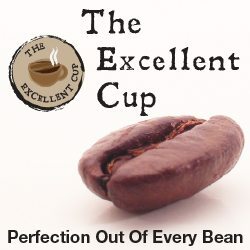 It has this toasted nut quality which helps with the complexity. 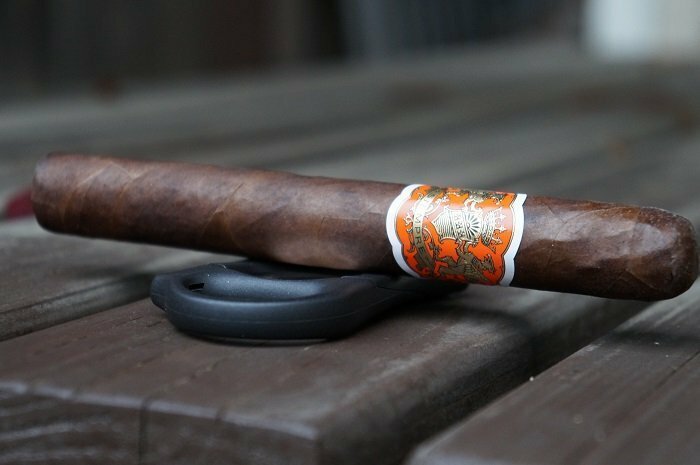 The cigar remains at a medium-full level and it has a nice finish. The burn line was straight at times and slightly wavy at others. The ash held on in inch and a half increments. The cigar did not start out well with the burn. 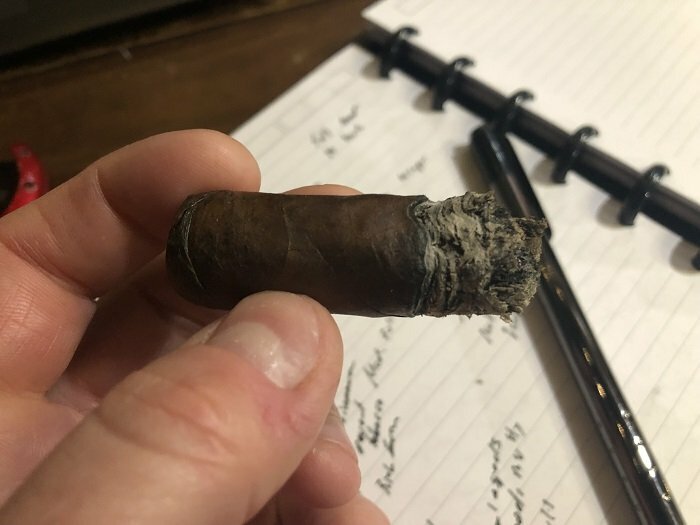 There was a moment where the ash started having a mind of its own, but it corrected as the cigar progressed and towards the end was smoking well. The coloring was a nice charcoal from start to finish. The flavor profile started with cedar, cream and a unique cinnamon/black pepper combination. As it went along the cedar transitioned to oak and the cream transitioned to mustiness and was the core the rest of the way. Construction was very good and required no attention. Strength was right around medium the whole way. 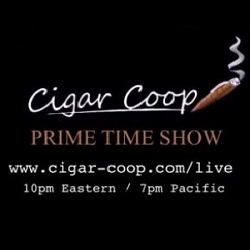 Dapper Siempre Sun Grown Toro is a nice addition to the Dapper portfolio and a cigar that I could see doing very well. 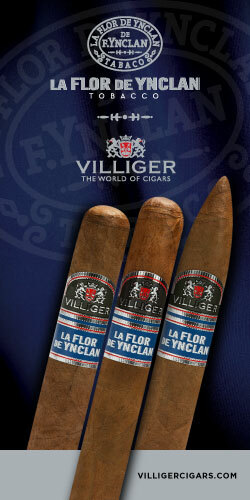 It would also be a good introduction to the brand for those who haven’t had a chance to smoke anything from them yet. 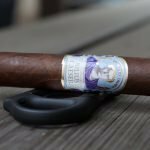 If you like wood forward profiles and some obvious transitioning, then this is a cigar to check out. I would gladly smoke more of these in the future. 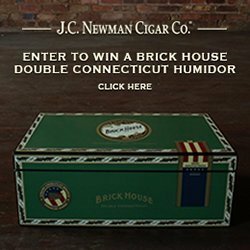 The draw was a little bit looser than I like on my cigars, but I took my time with the smoke so it did not smoke too fast. With that being said, there was a cool draw from start to finish. 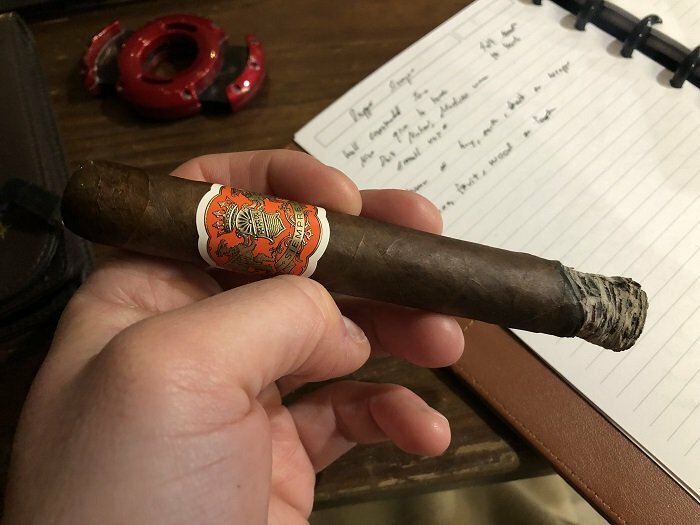 The Dapper Siempre Sun Grown Toro was not a bad cigar and I liked the Broadleaf and Sun Grown combo for the wrapper and binder. Maybe it is me, but I am pleasantly surprised by Dapper’s offerings. They don’t show an abundance of transitioning throughout, but they have a nice complex core that keeps you entertained. 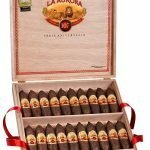 It is definitely a cigar I would smoke again, and would love to see if they could make it into a Lonsdale or something smaller to have me be more committed.